Presentation Focused on "What It Means to Be Hispanic in the United States Military"
KANSAS CITY, MO--(Marketwired - Oct 14, 2013) - Since 1988, Hispanic Heritage Month has been recognized and celebrated throughout the country and the United States military. In honor of the 25th anniversary, the 6th Battalion 101st Combat Aviation Brigade from Fort Campbell, Ky., invited Grantham University's Nicole Gowdy, education outreach regional director for Tenn., Ky., Ind., and W.Va., to share her thoughts on "What it means to be Hispanic in the United States Military." On October 10th, Gowdy spoke to an attentive audience in the Wilson Theatre on her personal experiences as an Army spouse and being part of a military family -- her father retired after 20 years on active duty, including 15 years at Fort Campbell. "Honor, passion and respect, these are three things that are crucial when serving in the military," Gowdy explained. "These are also three things that have been instilled in us, as Hispanics, from a very young age. We have always been taught that family comes first, which goes beyond our immediate family. It carries over to our cousins, our grandparents, and even our military units. This is why it's not surprising that currently there are around 2.1 million Hispanic veterans in the United States." "Currently, Hispanics make up 16.3 percent of the population of the United States," she pointed out. "By 2050, it's projected that we will make up a quarter of the nation's workforce. As such, we need to educate ourselves. Doing so is a priceless gift for ourselves and our family, one which can never be taken away. We must continue our legacy, set an example for our children, and most importantly, continue giving back to the country that has given us so much." Grantham University has been educating service members, veterans and military spouses since 1951 and this year was named one of the top "Military Friendly Schools" by G.I. Jobs for the fifth consecutive year. To learn more about military programs available for service members and veterans, visit: http://www.grantham.edu/military/. 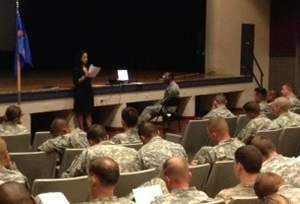 Grantham University's Nicole Gowdy speaks at Fort Campbell for Hispanic Heritage Month.